I have two beautiful offices on campus, my permanent office in the philosophy department and an office in the brand new humanities building that I will occupy as long as I direct the large interdisciplinary program required of all freshmen and sophomores at my college. Each of these offices is filled with penguin paraphernalia. Penguin figurines, penguin calendars, penguin stuffed animals of various sizes, penguin slippers (really), a penguin tissue dispenser, penguin pictures and posters. Not long ago a student stopped by during office hours. About ten minutes into his visit, he observed “I guess you must like penguins.” “What makes you say that?” I asked. 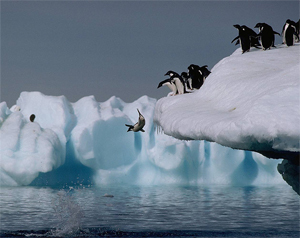 Penguins spend a lot of time on the ice, but are sea birds as graceful in the ocean as they are clumsy on land. Penguins have few natural predators on land, but are a favorite meal for any number of water creatures, including leopard seals and sharks. When penguins want to take a swim, they will collectively crowd toward the edge of an ice cliff overhanging the water, pushing and pushing closer to the edge, sort of like a human crowd preparing to board an approaching subway, until one or two penguins fall off the edge into the sea. If these unfortunates do not surface, it is clearly not safe to swim there. If their heads bob above the surface, a virtual waterfall of penguins follows them for a safe swimming and feeding event. 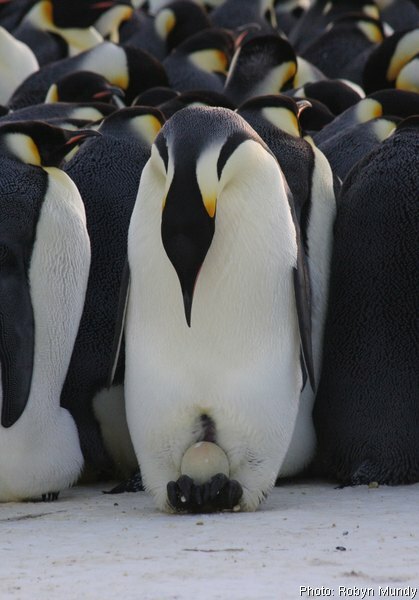 Emperor Penguin couples spend their lives apart from each other and meet once a year in late March, after traveling as far as 70 miles inland—on foot or sliding on their bellies—to reach the breeding site. 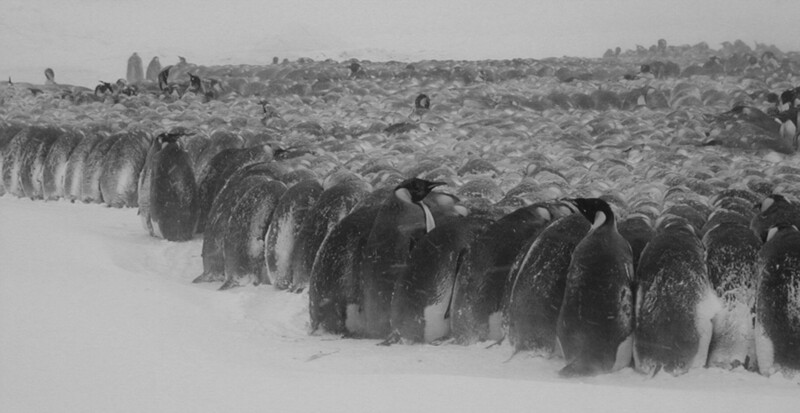 Once there, penguins look for their mates by making a bugling call. Male penguins generally stay in one place, lower their head to their chest and call out to the females. 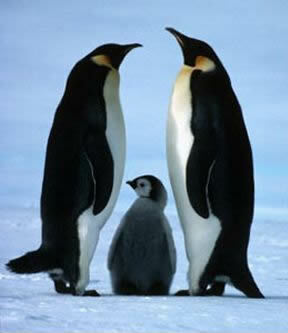 Once they find one another, they stand breast to breast, repeatedly bow to each other and bugle penguin songs. Penguins are “serially monogamous.” Each penguin couple is an item for a single breeding season, but if they can’t find each other the next breeding season (and they usually can’t), they will hook up with someone new. 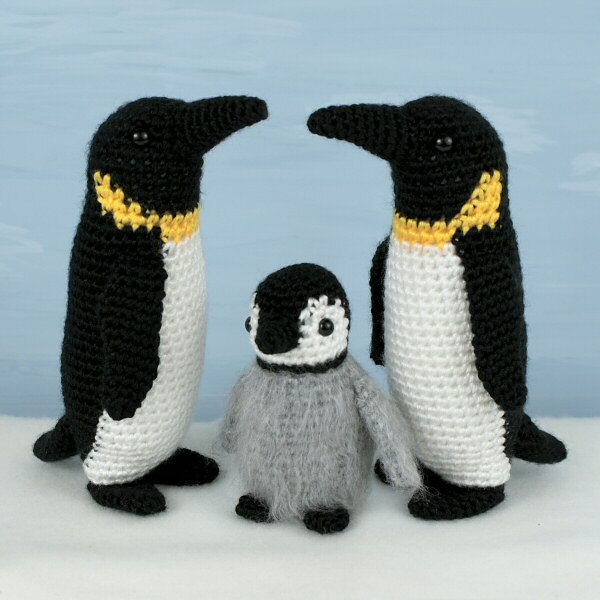 My obsession with penguins goes farther back than I can remember. I had a vast menagerie of stuffed animals as a young child ranging from bears to monkeys, but was most attached to a small penguin that eventually wore out from being carried everywhere, from bedroom to bathroom to dining room, during my waking hours. When asked by various and sundry adults why I liked penguins, I usually said “because they are always well dressed.” And they are. 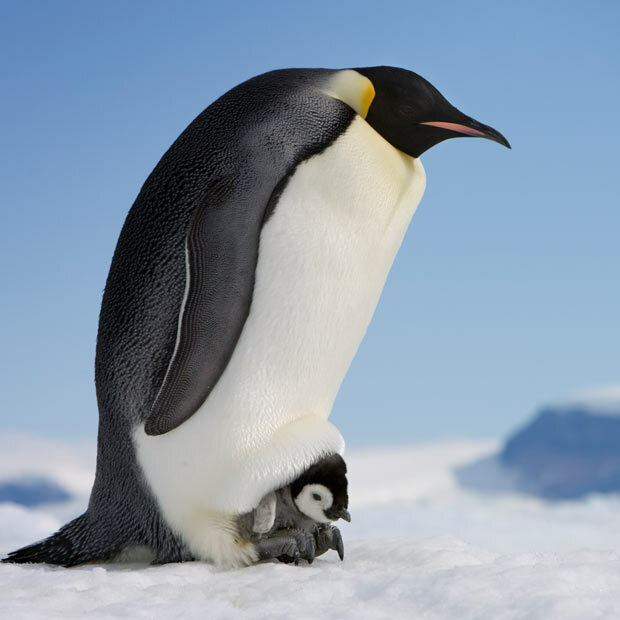 Once the egg is laid, it is transferred by the female Emperor Penguin very carefully to her mate (if the egg touches the ice, it would freeze and die), who then keeps the egg warm by holding it on top of his feet and tucking it under a large fold of skin until it hatches. The female penguin immediately returns to the sea to feed, leaving the male without food for about two months. The male penguins huddle together in large groups to conserve body heat in the cold and harsh environment, where winds can reach up to 120 miles per hour. When the female returns, she finds her mate (and chick) by listening to one particular bugle over thousands of others. Jeanne fully understands my penguin obsession. She should, since she has a similar obsession with Holstein cows. Our house, as well as her office at her new job, is full of Holstein reminders. Our main bathroom has white walls with black Holstein spots and a pink ceiling (for the udders). It’s a good thing we don’t ever plan to move, or some repainting of the bathroom would be in order. 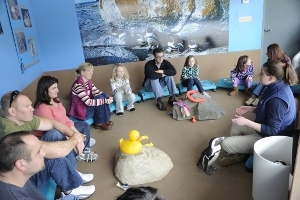 Once several years ago my birthday present from Jeanne was a behind-the-scenes visit to the penguin exhibit at Mystic Aquarium, forty-five minutes south of Providence. Along with a dozen or so other privileged penguin enthusiasts, I found out about the breeding and feeding habits of African penguins in captivity and actually got to touch one. My colleagues and I sat in a circle in the middle of the floor, and the penguin-meister brought in a two-foot tall penguin, setting her down in the middle of the circle. Her name was “Yellow-Yellow,” after the colors of the two identifying bands on her flipper. I swear that Yellow-Yellow liked me best. She waddled right over to me, ignoring the woman on my left and the kid on my right. Or at least that’s my story and I’m sticking to it. By now, regular readers of this blog are asking “Okay, what has your penguin obsession taught you about God?” Nothing, as far as I know. “How has your penguin fetish informed your teaching over the years?” Not at all. I’m sure there is something important in the facts that I am obsessed with black and white birds, Jeanne loves black and white bovines, and the official colors of the place I teach are black and white. But maybe not. Don’t tell me you don’t have at least one obsession that you can’t explain other than that you have it. Bottom line, I love penguins because penguins are cool. It’s a first principle. This entry was posted in creativity, family, friends, humor, Jeanne, Penguins, teaching on September 25, 2013 by vancemorgan. Mine? Thistles. Why? I love the colors and the shapes. That’s why. For one of my colleagues down the hall, it’s owls. I also am a big fan of cardinals, but that’s not as unusual as penguins. My favorites are Pelicans because they look prehistoric!